Hopes to replace both Castle Manor and Place Farm school premises with state-of-the-art 21st century school buildings were unveiled to Haverhill Town Councillors last night by the head of the schools. Madeleine Vigar, head of the Castle Partnership, outlined the progress made at Castle Manor college in the nine years since she became head, and moves towards all-through schooling by joining with Place Farm primary. Now Haverhill had two schools dubbed 'outstanding' nationally,in Castle Manor and Samuel Ward, the latter an academy already and the former scheduled to become one this summer, they were looking towards where to progress next. Castle Manor is housed in buildings dating from the 1950s when it became Haverhill's first secondary school, and from when it was extended in the 1970s when the school leaving age was raised. The old buildings, though not now very suitable, were still being refurbished, but the newer ones had virtually come to the end of their useful life and would need replacing soon, she said. The school now used the former Parkway Middle School for its communications facility, but this was not a long-term measure. "For the future the town will have to look at something fifferent from the current buildings she said. "I want to see a primary and secondary school on the same site, but I have to admit I have no money for it. "I would want to put the new secondary school at the far end of the site, with an entrance from Park Road." This would enable the current buildings to be demolished and part of the site to be given over for development, as is already envisaged in the Haverhill Vision 2031 planning document, which might help with funding the project. "We want to give Haverhill state-of-the-art 21st century all-through school provision," she said. "I'd like it to be a flagship school building." Suffolk County Council was stepping back from its traditional role as a school provider and becoming more of a school commissioner, she said, and we were moving into a different era. "I believe schools are the central point of the future of the town and I am asking the town council to support this vision," she said. Town mayor Cllr Maureen Byrne said many people were frightened by the idea of the schools becoming acadamies because they thought it might mean special selection criteria. 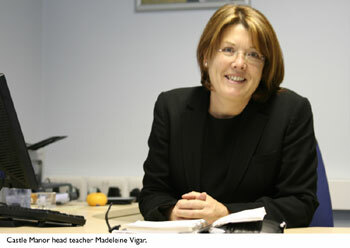 Ms Vigar stated categorically that the Castle Partnership had no intention of changing its admissions policy. Some schools had changed their clientele to improve, but Castle Manor had improved with the same clientele and it intended to continue doing so. In answer to questions she also said she did not intend to leave the work unfinished. "I am here for the long haul," she said. "I am not going anywhere." The mayor led several councillors in paying tribute to the work Ms Vigar and her staff had done in turning round Castle Manor during her nine years, during which time she had also overseen pulling Castle Hill Middle out of special measures and, more recently done the same job with Place Farm. Councillors agreed to support the partnership's vision for the future. No comments have been posted for this news entry.